Home > Lemonsider > Wally’s World | Instant Replay, Bring On the Tech! I couldn’t help but notice the lack of instant replay video review in the NCAA Tournament. That makes sense because there isn’t any. The sports entertainment industry has come a long way from its early days of undeniable human error element. From the times where Maradona made the iconic refereeing no call with “La Mano De Dios” or “The Hand of God”, (wasn’t he offside?) if not for today’s technology, this play may have robbed us of a greater finish or extra time. I guess it all depends on who you ask. How important is it to have a major human error become an iconic moment anyway? For me, if this play was erased, it would be a sign of prosperity. Did the immaculate reception by Franco Harris touch the ground? If you ask the players from the Raiders sideline, that ball definitely hit the ground. We can only hope to no longer be robbed of these truths and have the answer on whether the play we see is legitimate, like when a referee makes a phantom pass interference call to rob the University of Miami of a National Title against Ohio State. Technology in broadcasting games has provided the fan with perfect vantage points of the game, give or take the network transmitting the game. However, for the most part, there is usually an angle that can capture the truth. As a species, humans make mistakes. There is no denying that fact, but with the advancement of technology comes great responsibility. In tennis, John McEnroe may have come off as a gentleman if the replays had backed up his claims to the umpires and line judges. This persona may well have been sacrificed, but you never know. He probably would have done the same and fought technology. Through the help of Hawk-Eye Innovations, technology is now assisting in critical decision making during close plays. In soccer, we have goal line technology to confirm whether a ball completely crossed the line for a goal. The same exists with tennis to help decide if the ball was in or out. All this toward efforts to get the call right without the need of human error interfering with the truth. The biggest goof in sports right now is positioning the football at the line of gain. Give me a break. You’re going to tell me that referees in football can accurately pinpoint to the inch where the ball was when the player was ruled down? How many countless yards have been lost throughout the course of a game due to guesses made by the field zebras? You’re telling me that there isn’t tech now that can pinpoint where the ball is exactly at the point the player was down? The NFL has enough money to invest in new technology that they can then showcase and test run during the preseason. Additionally, why not include sensors on gloves to determine exactly when a player loses possession of the ball? You can have sensors on a ball, and you can have them on the gloves as well. Nanotech is good like that. Coming in a close 2nd as the biggest goof in sports is the umpires calling balls and strikes. It’s blatantly obvious that the amount of human error in this process is high. Baseball is a different animal, however. There’s a reason it’s called America’s “past time”. I mean, they conduct their business like they were still going for the same ratings as the 1940s. There have been no significant improvements to the game in 150 years. The game is pretty much unwatchable for the casual fan. No other league is in dire need of improvements through tech. The umpire is useless. It’s the toll-booth job of baseball. That’s right! A “machine” can do a better job than the umps. I just finished watching Mets vs. Marlins. A Mets player attempted a bunt, but the ball hit his hand and it was ruled a “hit by a pitch”. Can someone explain this to me? They even went to review the play, but because of limitations to what you can and can’t review, the play stood. Come on, guys… Let’s use the technology to its full potential or nothing at all. 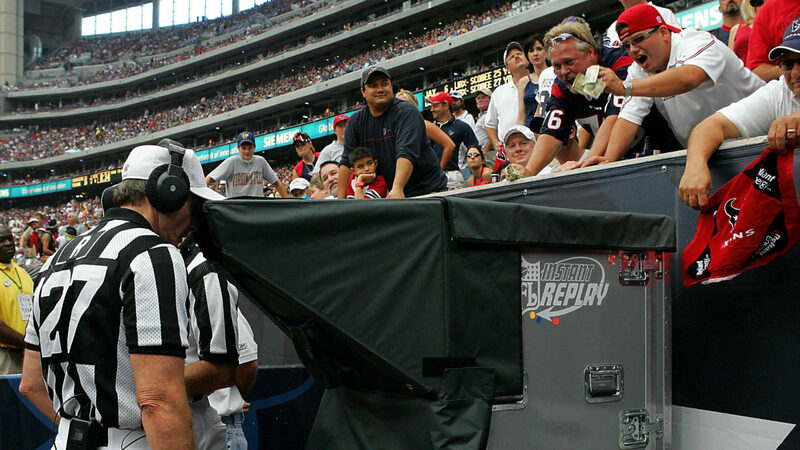 Why have a “video-review”, if you can’t review the normal intricacies that occur during a game? This goes for all leagues across the board. The last two minutes in team sports are indisputably the most intense moments of the game. Prone to errors and the highest rate of close calls, we can limit the number of technical corrections to this period while the world audience adapts to the determinations. But I, for one, cannot stand the pauses in the games, we need to get the calls right without having the refs monitoring the replay and stopping the momentum. Have the tech make the call and buzz the ref the answer, no questions asked. Obviously, the play has to fall under the circumstances in which tech can make the call. For example, ball out of bounds, the line of gain, player’s foot on the line, etc. We have allowed technology to enter the game and influence decision making already, so why not take it a step further to correct as many “call stands” situations as possible. I do not see the charm in the human error element affecting the game. Let’s put our egos aside and make the right call on this. Pun intended. Welcome to Wally’s World, leave a comment below and follow me on Instagram!